There were few really BIG names this time round , the usual host of second league UK bands, with a smattering of imports. The Reggae acts apparently received a mixed reception , with a tinge of racism creeping into the audience response , which was unfortunate to say the least . Apparently ace drummer Sly Dunbar was nearly hit by a can , a sign of the burgeoning division and acrimony that would increasingly pervade British society and which led to the establishment of the Rock Against Racism campaign of the early 80s . For some reason, Reading had turned into "can alley " , with increasing numbers of can fights - due no doubt to the tendency of larger and larger portions of the audience to render themselves semi comatose due to massive binge drinking . Alcohol was taking over from pot smoking as the drug of preference, or people were mixing both to excess , which is never a good idea . The racist taunts were worrying as they occurred in front of an audience that should have appreciated reggae. 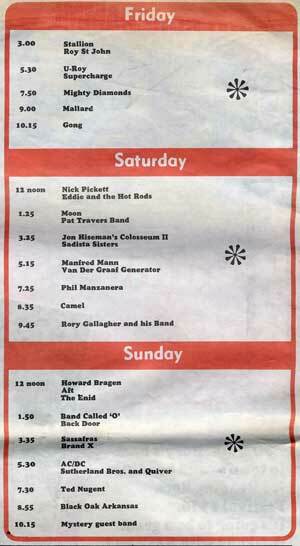 Perhaps it was the sort of bands which were booked, but really , the eclectic mix on Fridays bill -with bands like Gong and Mallard (normally hippie bands par excellence) headlining- was hardly designed to attract the narrow minded. Probably ( as usual ) a small minority were to blame for the problems, I can remember curly haired ,bead wearing, flower children hurling toilet rolls at the luckless soul band ' Little Women' at Woburn in 1968, it was a minority, but if they had had cans, I'm sure they would have thrown them ( as happened to Rod Stewart at Sunbury in 68 when a band of Geordies forced him behind the stacks as they pelted him with Newcastle Brown cans ) .Despite the trappings of peace and love , audiences were not always tolerant in the 60s. These incidents were generally isolated ,however, but at Reading they seemed to become the norm as the decade lurched forward and many of the British became increasingly cynical and disillusioned . Unemployment was on the rise, the freak movement was seen to have failed in its bid to change the world . 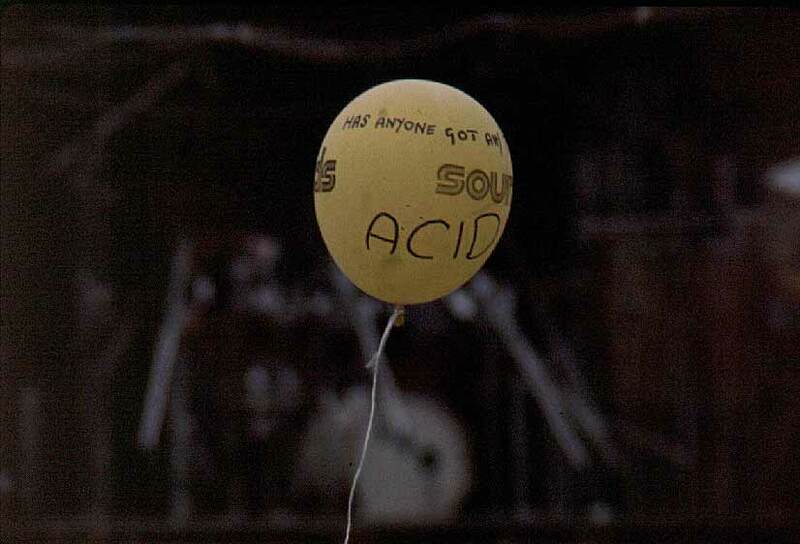 People were using drugs more to blot out reality than to enhance their consciousness and were also mixing and using harder drugs such as speed with booze as well . Reading crowds increasingly embraced alcohol as their drug of preference and the sea of cans that were shown to completely cover the ground in a documentary of the festival aired on television in the late seventies was ample evidence that booze was not going to go away, in fact for many , it became a badge of manliness to indulge in conspicuous over consumption during the course of the weekend. However, the atmosphere at the festival wasn't overly aggressive, a lot of the antics were carried out by young kids. 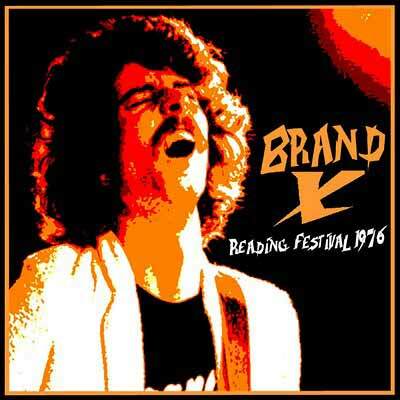 If one looks at the crowd photos, its amazing how many 14-16 year olds were at Reading (indeed , my first all weekend festival was the Nat Jazz in 1968 and I was only 16 myself ) . Now , adolescent boys are not known for their stability and when they are pissed and in packs , its only natural that they become "silly " . So I think most of this was fairly good natured daftness, but that's no consolation when you are on the receiving end of a half full metal can . When plastic bacame the norm it wasn't quite as bad. Unfortunately , with a fair percentage of the crowd completely legless and fueled by the craziness that booze imparts to some of us , it was almost inevitable that can fights became a festival tradition. This in turn put off any sort of family element from attending the festival, as even the most feckless parents are not going to take their kids to a show where they are likely to be hit on the head by a half full can of Watneys . This reckless practice gradually put off a good percentage of folks who just wanted to go to a festival to listen to the music . As a result , this led to the National Jazz festival becoming more and more the preserve of single males who wanted to get completely off their faces . This affected the sorts of bands that were to feature at the festival. In 1976 , we were seeing the last of the jazz rock bands (Brand X and Colosseum ) and the first of the new breed of the heavy rock acts like AC / DC who were to dominate the festival lineup for the next decade . Also, the festival now had virtually dropped the jazz and blues title it had bourne for over a decade, it was barely visible in tiny letters under the program title. It was well on the way to becoming a fully fledged 'rock ' festival. The change of name really marked the beginning of a change in ethos. Are quite numerous , but uncommon , but if you dig they are available for trade on the net (we don't have ANY of these ourselves, nor do we know who has them) . It appears tapers were around on all three days , the Gong is reported to be an FM , but since it is poor quality, and none of the other sets are reported as a SBD or FM , its more likely to be an audience tape . 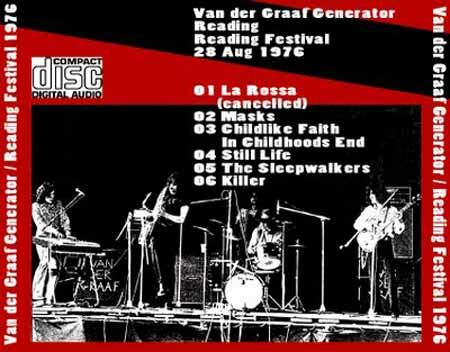 Unfortunately the BBC do not seem to have been in attendance , although portions of the festival were recorded by the Beeb most years after 1979 , the years when the festival became more heavy Rock orientated. Pierre Moerlen: Drums, Didler Malherbe: Sax & Flute, Mireille Bauer: Percussion. Benoit Moerlen: Percussion, Francis Mose: Bass, Allan Holdsworth: Guitar. Colosseum . 8-28-76. Recording exists , no known source. The set played by Phil Manzanera's 801 was the second of only three live performances that this band ever made. 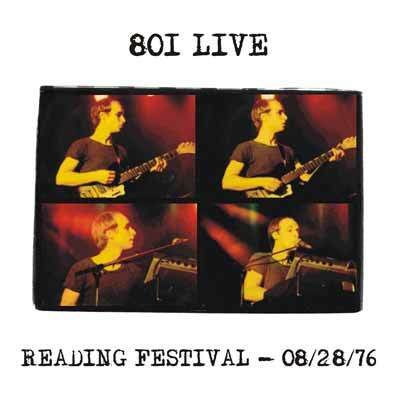 The album 801 Live was from their last gig at The Queen Elizabeth Hall . 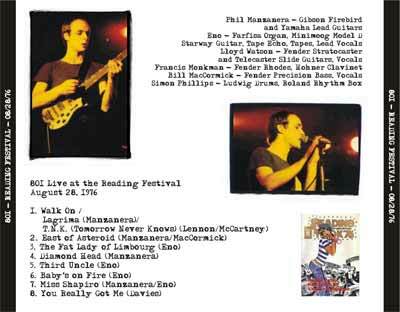 According to some sources, the Bootleg Eno album,Dali's Car , has a track or two from the Reading gig . 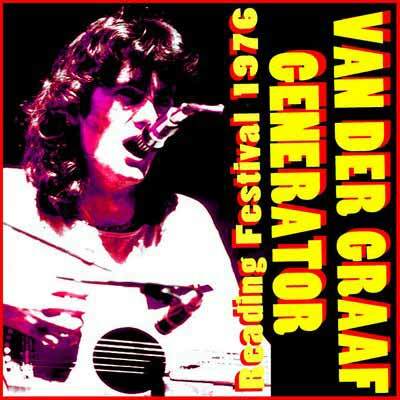 Van Der Graaf Generator 8-28-76. Childlike Faith in Childhood's End. 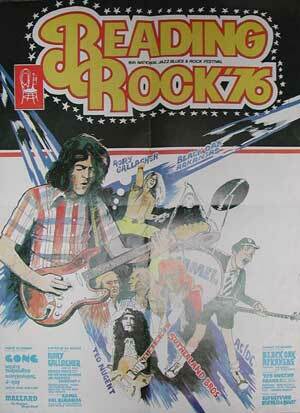 Reading 76 photogalleries Updated November 2012 .